I usually use the standard printed invitations from our site for my girls' birthday parties, but for Kaitlyn's 6th birthday she wanted to do something a bit more crafty for her invitation. This is what we came up with. In my opinion, this is appropriate for age groups that can help (or do most of the work) making their invitations or for moms who really like crafting... If you're not such a fan of crafts, just use the regular printable cards and save your energy for all the millions of other things you'll have to do -- don't burn yourself out before the party even starts! (there's a ladybug in the summer theme and one of these days I'm going to add an insect theme). silver gel pen or white pencil crayon. I just used plastic lids in different sizes and did it without a template, but it's up to you. Glue the template onto a piece of cardboard (old cereal boxes or the back of a paper pad work well) and let dry. Trace template pieces onto poster board (body onto black and wings onto red). Punch a hole in the corner of each wing. Line the wings up on the body and mark where the holes are (one tack should go through both holes). Use a sharp pencil to poke a hole in the body. Glue the spots and eyes onto the ladybug. Use a gel pen or white pencil crayon to write the invitation information. 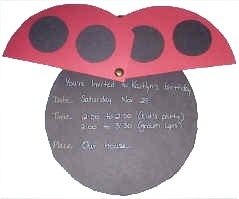 Note: you can just make the invitations from paper instead of cardstock and use the color template to save yourself some time... but the cardstock wings hold up a bit better especially since the kids tend to "flap" them.